QAGS is an interesting little game and my post today for Q. A bit of history. Back when RPGs were becoming popular it was quickly obvious that people liked to play multiple games, but not always play with multiple rules. D&D had one ruleset, Boot Hill another, Star Frontiers another and so on, and this was all in the same company. The need then for a "Generic" system arose. Something you could learn once and use anywhere. This was the birth of GURPS and many other games such Fudge, FATE, Fuzion, QWERPS and eventually QAGS and even d20. 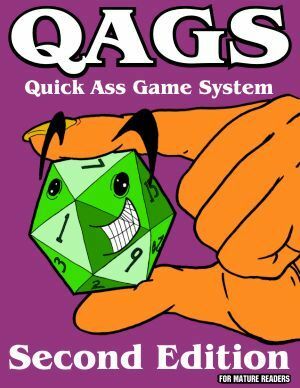 QAGS though is a little looser than GURPS, but not quite as loose and Fudge or FATE. QAGS is nice because it works well as an entry to Role-playing that is not a kids game (by no means is this one for kids!) and it can be used by the old pros out there. Yums-Yums aside of course! Chapter 2 is Doing Stuff or how to play. The system is pretty simple really. Words are given a value of 6 to 16 and skills can add up to 5 to these. These numbers then become the target numbers. Chapter 3 expands on this with Combat. Appendix 2 is the quick start rules. 1/2 a page. They got the Quick part right. So quick in fact it is "Qik" start. Appendix 3 is the section of Genres. Each one gets a page and covers the basics. Appendix 4 is a collection of sample characters. And 11 is a conversion from QAGS 1st Ed. Finally ending with a character sheet. The first I have seen that lists Social Security Number. Sounds a bit like the BESM tri-stat system. Body/Mind/Soul, though it grew quite a bit as new editions arose. Sounds like a lot of fun. I remember GURPS but haven't played this one. Yet. Wow, who knew?! I need to quick a*s game system my sequel outline so I can start working on the sequel to my futuristic thriller, Fireseed One. Now I have a new sort of way to chide myself. Sounds much too complicated for me! How is it that my husband who has been roleplaying forever has never heard of this? We may have to find it and try it.